The Clark County School District (CCSD) in collaboration with the Las Vegas Global Economic Alliance (LVGEA) is proud to present the Futuready Industry Tours, a series of industry-specific tours connecting local industry with Southern Nevada’s future workforce. These 90-minute tours provide industry leaders with an opportunity to connect with our local CCSD Magnet Schools and Career and Technical Academies to learn first-hand how our students are preparing for the workforce and to forge partnerships with the schools. 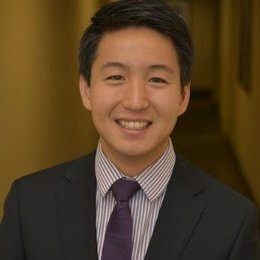 The LVGEA team says the Futuready Industry Tours are all about connecting entrepreneurs and local business-people with students enrolled in programs relevant to those businesses. Futuready Industry Tours came about via informal conversations between the Clark County School District (CCSD) and the Las Vegas Global Economic Alliance (LVGEA). As the largest school district and largest economic development organization in Nevada, CCSD and LVGEA have a mutual interest. Out of those conversations, the two groups decided to host a series of industry-specific tours in hopes that people employed at businesses can meet administrators, teachers, and students to learn about programs that are training their future workforce. 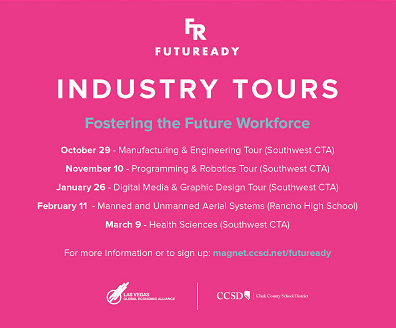 The next Futuready Industry Tour is taking place on Tuesday, November 10, 2015 from 8:30 – 10:30 a.m. at Southwest Career and Technical Academy. CCSD and LVGEA are inviting companies interested in computer science/programming as well as robotics to meet students enrolled in robotics and computer science programs at Southwest Career & Technical Academy. CCSD and LVGEA are hoping that industry professionals have a chance to connect with students, staff, and administrators in a meaningful way at this event. This event is free and open to the public. #VegasTech community members can get involved by attending the event on November 10, 2015 and by reaching out to the Magnet Schools to learn more about partnerships and how to get involved with students interested in careers in technology. Those interested in attending the event can RSVP here.